Grab your ice bucket, stock up on K stars, and join Forced Meme Productions at the annual event Mashable describes as “what happens when you let the Internet party IRL.” The internet’s most favorite costume party is back in Brooklyn for our sixth year! Join for an evening of dancing, drinking, nerding out and out-nerding. Take a twirl in our photobooth and impress our esteemed panel of internet experts who will be sizing up your costumes for our competitive costume contest. The party is free, but RSVP is required. Doors open at 8:30pm and costume contest winners announced at 10pm. 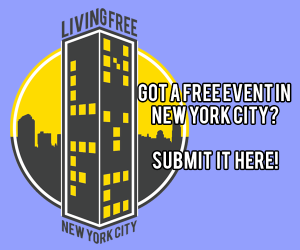 Diana joined Livingfreenyc as a social foodie fluttering about the city until she learned of the place to party for FREE! An analyst by day, she volunteers for the South Street Seaport Museum in her spare time and enjoys anything and everything to do with live music, food events and the great outdoors.